Dole Food Company, Inc. is an American agricultural multinational corporation headquartered in Westlake Village, California. The company is the largest producer of fruit and vegetables in the world, operating with 74,300 full-time and seasonal employees who are responsible for over 300 products in 90 countries. Dole markets such food items as bananas, pineapples, grapes, strawberries, salads, and other fresh and frozen fruits and juices. Dole owns a shipping line, Dole Ocean Cargo Express. Dole's chairman founded the Dole Nutrition Institute, a nutritional research and education foundation. The company traces its origin to the 1851 establishment of Castle & Cooke by missionaries Samuel Northrup Castle and Amos Starr Cooke. Castle & Cooke rapidly became one of the largest companies in Hawaii, investing in shipping, railroad construction, sugar production and seafood packing. The other half of Dole's corporate heritage, the Hawaiian Pineapple Company, was founded in 1901 by James Dole, who opened his first pineapple plantation in the central plateau of the Hawaiian island of Oahu. Sanford Dole, the cousin of James, had been president of the Republic of Hawaii from 1894 after the overthrow of the Kingdom of Hawaii (her last monarch, Queen Liliʻuokalani), and first governor of the Territory of Hawaii until 1903. The annexation of Hawaii to the United States made selling agricultural products to the mainland much more profitable, since they would never be subject to import tariffs. In 1932, Castle & Cooke purchased a 21% interest in the Hawaiian Pineapple Company. In the 1960s, Castle & Cooke acquired the remainder of the Hawaiian Pineapple Company and the Standard Fruit Company. In 1976, it acquired Bud Antle Inc., a California-based lettuce and celery farmer; it was renamed Dole Fresh Vegetables in 1989. The company was renamed "The Dole Food Company, Inc" in 1991. Castle & Cooke Inc, a real estate company, was spun off in 1995; it is currently operating as a subsidiary of Flexi-Van Leasing, Inc. Dole's Waialua Sugar Mill closed in 1996. Dole acquired Coastal Berry in 2004 and SunnyRidge Farms in 2011 to enter the berry business. It was then the third largest producer and U.S. importer of bananas. Dole and Chiquita remain the top two U.S. banana companies as of 2011. In 2011, the company reported $7.2 billion in annual revenue. As part of a major restructuring in 2012, Dole agreed to sell its worldwide packaged foods and Asian fresh produce businesses to Japanese trading house Itochu for $1.7 billion in cash. The transaction paid down a large amount of Dole's debt and refocused the company's business on fresh fruit and vegetables. The businesses acquired by Itochu continue to use the Dole brand and are owned by Dole International Holdings, a Tokyo-based subsidiary of Itochu. In August 2013, Dole announced that CEO David Murdock would acquire the outstanding stock of the company for $1.2 billion. The sale closed in October 2013, but was challenged by shareholders who argued that the company was undervalued, based in part on underestimated cost savings from the 2012 sale of the Asia business. In 2015, the Delaware Chancery Court awarded $148 million in damages to the former shareholders, on the grounds that Murdock and chief operating officer C. Michael Carter had misled shareholders regarding the finances of the company. Dole, which had moved its corporate registration from Hawaii to Delaware in 2001, became an outspoken critic of Delaware corporate law as a result of this litigation. Dole is a vertically integrated producer, owning plantations in Central America. It operates a fleet of 19 container ships that are specially equipped to support refrigerated containers and have their own cranes instead of relying on port infrastructure. In April 2017, Johan Linden was named Chief Executive Officer, in addition to his role as President, and Johan Malmqvist was Chief Financial Officer. Including the original pineapple, Dole distributes fresh plant foods in the forms of whole fruits, whole vegetables, berries, and fresh-cut vegetables. Packaged products include fruit bowls, fruit bowls in gel, fruit in plastic jars, fruit parfaits, fruit crisps, dates, raisins, and canned fruits. Frozen products include berries, tropical fruits, and fruit bars. Juices are sold chilled, frozen, or canned. Salad products include greens, salad kits, and shreds. In 1998 Dole bought several growers in Colombia and became the largest distributor of fresh-cut flowers in the US. However, by 2008 the flower business was losing money, and it was bought in January 2009 by a group of private investors. In 1994, Dole announced that it would finalize its plans to build its world headquarters on a 30-acre (120,000 m2) site owned by the company, located north of the Ventura Freeway in Westlake Village, California. The decision had been delayed by groundwater contamination tests and reviewing of possible site plan revisions. Having submitted its plans for final approval by the Westlake Village City Council on February 9, 1994, Dole completed construction and opened its new world headquarters building in May 1999. The Guinness Book of World Records (2007) lists the pineapple maze at the Dole Plantation in Honolulu, Hawaii as the world's largest maze. The Dole Nutrition Institute (DNI) was founded by David H. Murdock in 2003 to "Feed the World with Knowledge" through research and education regarding the health benefits of a plant-based diet. Bobby Banana is a mascot of Dole Food Company and the leader of the SuperKids (children who regularly eat five to nine fruits and vegetables every day). He is an anthropomorphic banana who appears in Dole comics and games for children, along with friends Courtney Cauliflower, Mia Mango, Pinellopy Pineapple, and Gavin Grape, all of whom are also anthropomorphic fruits and vegetables. In 1985 and 1986, the Dole banana was featured as the official banana of the Pittsburg State University (KS) Gorillas' athletic programs. The project was the brainchild of then Pitt State radiosports play-by-play voice Scott Burton. The introduction of the Dole banana as the official banana of the Gorillas delighted then Athletic Director David Suenram and Pittsburg State University sports fans alike. The head football coach at the time of the promotion was Dennis Franchione. 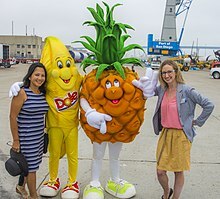 Dole provided company trinkets for fan giveaways and the popularity of the Dole banana thrived in southeast Kansas and southwest Missouri (Joplin) during the promotion's two-year run. For a number of years, the country music artist Kenny Rogers advertised Dole's products on television. He would often be accompanied by his then wife, Marianne. Dole also sponsored several of Rogers' concert tours. In 2005, 23 people in Minnesota were sickened with E. coli O157:H7. The source of the bacteria was found to be Dole brand bagged lettuce. In 2006, an E. coli outbreak that caused over 200 people to become ill and killed 3 more was linked to bagged spinach sold by Dole. The spinach was processed by Natural Selection Foods in California. In September 2007, random testing conducted by the Canadian Food Inspection Agency detected E. coli O157:H7 bacteria in Dole's "Hearts Delight" packaged salad. The company issued a recall for the product, which had been distributed in Ontario, Quebec, New Brunswick, Nova Scotia, and Prince Edward Island in Canada, and in Illinois, Indiana, Maine, Michigan, Mississippi, New York, Ohio, Pennsylvania, and Tennessee in the US. In April 2012, random testing by the New York State Department of Health detected Salmonella bacteria in Dole's "Seven Lettuces" salad. The company issued a recall for the product, which had been distributed in Alabama, Florida, Illinois, Indiana, Maryland, Massachusetts, Michigan, Mississippi, New York, North Carolina, Ohio, Pennsylvania, Tennessee, Virginia and Wisconsin. In June 2012, random testing by the North Carolina Department of Health and Human Services detected Listeria monocytogenes, the bacteria responsible for listeriosis, in Dole's "Marketside Leafy Romaine" salad. The company issued a recall for the product, which had been distributed in Georgia, Kentucky, North Carolina, South Carolina, Tennessee and Virginia. In August 2012, random testing by the North Carolina Department of Agriculture detected Listeria monocytogenes in Dole's packaged "Italian Blend" salad. The company issued a recall for the product, which had been distributed in Alabama, Florida, North Carolina, South Carolina, Pennsylvania, Maryland, Mississippi and Virginia. In March 2014, random testing conducted by the Canadian Food Inspection Agency detected Listeria monocytogenes in Dole's packaged "Italian Blend" salad. The company issued a recall for its Dole Italian Blend, Fresh Selections Italian Style Blend, Little Salad Bar Italian Salad, and Marketside Italian Style Salad products. The products had been distributed in Ontario, Quebec and New Brunswick in Canada, and Connecticut, Florida, Illinois, Indiana, Kentucky, Maryland, Massachusetts, Michigan, New Jersey, New York, North Carolina, Ohio, Pennsylvania, South Carolina and Virginia in the US. In October 2015, random testing conducted by the Michigan Department of Agriculture and Rural Development detected Salmonella bacteria in a sample of Dole's packaged spinach salad. The company issued a recall for the product, which had been distributed to Connecticut, Indiana, Kentucky, Maryland, Massachusetts, Michigan, Missouri, New Jersey, New York, Ohio, Pennsylvania, Tennessee, and Wisconsin. In January 2016, packaged salads produced by Dole at its Springfield, Ohio, facility were linked to a multistate outbreak of listeriosis by the Centers for Disease Control and Prevention (CDC). The outbreak was first detected in July 2015 and led to the hospitalization of 12 people from Indiana, Massachusetts, Michigan, New Jersey, New York, and Pennsylvania. The victim from Michigan died as a result of the infection. A joint CDC and Food and Drug Administration (FDA) investigation began in September 2015. In January 2016, testing of a Dole "Field Greens" packaged salad found the presence of Listeria monocytogenes, the bacteria responsible for listeriosis. On January 21, 2016, Dole suspended operations at the Springfield facility and began a recall of packaged salads produced there. The recall affected 23 states and 3 Canadian provinces, and involved salads packaged under the Dole, Fresh Selections, Simple Truth, Marketside, The Little Salad Bar, and President's Choice brand names. In April 2016, it was revealed that the U.S. Department of Justice had commenced a criminal investigation into Dole's role in the outbreak of listeriosis. FDA inspection reports obtained by Food Safety News using the Freedom of Information Act demonstrated that in July 2014 Dole carried out swab tests of surfaces in the Springfield plant which returned positive results for Listeria but still did not cease production. Swab tests returned positive results "five more times in 2014 and three times in late 2015" but Dole continued production until January 2016. U.S. Reprepresentative Rosa DeLauro said: "News that Dole knew about a Listeria outbreak in their facility, yet continued to push contaminated salads onto the American consumer is an outrage. How could executives at Dole even consider putting products onto store shelves and into American homes when they knew for close to two years that there was a major public health issue? These executives must be held accountable for their unconscionable actions." In 2001, Dole was involved in the suit Del Monte Fresh Produce Co. v. Dole Food Co. with Del Monte Fresh over the potential misappropriation of Del Monte's specially bred pineapple. James Dole, who founded the Hawaiian Pineapple Company, went to Hawaii in 1899, five years after his cousin (once removed), Sanford B. Dole had become first president of the republic, following the overthrow of the Hawaiian monarchy. Although his elder cousin was involved with the takeover of Hawaii, James himself was a teenager living in Massachusetts at the time of the coup. However, the company's commercial activities would not have been possible without the later annexation of Hawaii to the US, which resulted in the removal of high import tariffs on Hawaiian products. Removal of tariffs through annexation was one of the goals of the 1894 coup plotters, though annexation did not occur until 1898. The banana industry has traditionally been dominated by a few large corporations, which employ low-wage workers in developing countries. Dole was named as a defendant in a wrongful death lawsuit filed on behalf of 73 heirs of victims of paramilitary violence in Colombia. In 2007, Nicaraguan plantation workers, represented by Los Angeles-based personal injury lawyer Juan Dominguez, sued Dole and Dow Chemical Company, claiming the use of illegal pesticides such as the now banned Nemagon (containing DBCP) had made them sterile. The pesticide was not banned in Nicaragua until after Dole ceased its operations within the country. The suit and two others were subsequently thrown out by California courts after it was concluded that “[c]ontrary to their sworn testimony, most of the plaintiffs never worked on Dole-affiliated banana farms and none were involved in the DBCP application process,” while similar lawsuits were filed in U.S. and Nicaraguan courts. A lawyer for the Nicaraguans, Steve Condie, however, alleged that some of the witnesses had been paid by Dole to give testimony that the claims were fraudulent. The witnesses' identities were kept secret so that the plaintiffs' lawyers could not interview them. Swedish film director Fredrik Gertten made a documentary film about Dominguez and the alleged banana workers. The movie Bananas! * premiered in the 2009 Los Angeles Film Festival. Dole said they had serious concerns about the film's accuracy and they urged festival officials to "immediately cease and desist" their sponsorship of the film. The festival officials allowed the film to be screened, but it was not allowed to compete for placement in the competition. In addition, festival officials distributed information before the film's screening that indicated Dole believed the film to be factually inaccurate. Although the film was screened with a disclaimer from the festival, Gertten was subsequently sued for defamation by Dole. The lawsuit was dropped on October 15, 2009, and in November 2010 a court in Los Angeles found in favour of the movie crew making it possible to release the movie in the USA, and ordering Dole to pay SEK 1.4 million (roughly USD 200,000) to the filmmakers. Gertten's sequel Big Boys Gone Bananas! * documents Dole's reactions to Bananas!*. The Nicaraguan DBCP awards against Dole were overturned in July 2010. 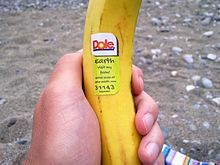 In May 2013 Oxfam demanded Dole remove its "Ethical Choice" labels from its bananas in New Zealand until it improved treatment of its workers in the Philippines, but Dole said Oxfam was trying to "destroy the Dole brand" in favour of other suppliers. In Oct 2018 Myanmar Government blacklisted Thailand subsidiary of Dole after investigation found that one of its factory in Thailand exploited Myanmar migrant workers by demanding payments for visas, medical check-ups and work permit fees. Myanmar migrant workers are also prevented from taking paid annual leave. About 130 Myanmar migrants who took annual leaves were prevented from returning to work and got fired instead. In 2012, Dole Packaged Foods contributed $171,261 to a $46 million political campaign known as "The Coalition Against The Costly Food Labeling Proposition, sponsored by Farmers and Food Producers". ^ "Dole Food Company Inc.: Private Company Information - Businessweek". Investing.businessweek.com. Retrieved 2012-10-05. ^ "Dole Food Company, Inc. Company Profile - Yahoo! Finance". Biz.yahoo.com. 2012-09-25. Archived from the original on 2013-01-16. Retrieved 2012-10-05. ^ "| Company Profile from Hoover's". Hoovers.com. Retrieved 2012-10-05. 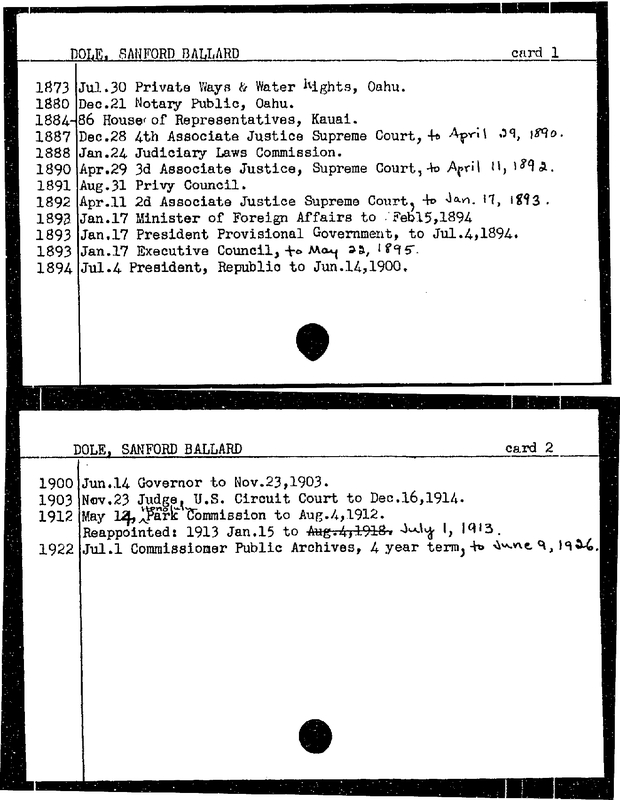 ^ "Dole, Sanford Ballard office record". state archives digital collections. state of Hawaii. Archived from the original on 2012-03-06. Retrieved 2010-01-20. ^ Star-Bulletin, Russ Lynch; (1996-10-02). "Waialua closing the book on Oahu's sugar industry - Today is the last day of harvesting and by Saturday the shutdown will be complete". Honolulu Star-Bulletin (HI). Retrieved 2018-04-22 – via NewsBank. ^ "Locations of Dole Food Company in Thailand". Dole Food Company. 2012. Retrieved 9 September 2012. ^ "Dole Business". Itochu Corporation. Archived from the original on 8 September 2015. Retrieved 2 September 2015. ^ "Dole Food Agrees to $1.2 Billion Buyout Offer". The Wall Street Journal. August 12, 2013. Retrieved August 13, 2013. ^ Hoffman, Liz (27 August 2015). "Dole Executives Ordered to Pay $148 Million in Buyout Lawsuit". The Wall Street Journal. Retrieved 2 September 2015. ^ Hoffman, Liz (2 August 2015). "Dole and Other Companies Sour on Delaware as Corporate Haven". The Wall Street Journal. Retrieved 2 September 2015. ^ Wang, Dan. "Meet Dole, the World's Full-Stack Banana Company". Flexport. Retrieved 5 January 2016. ^ "Vessels". Dole Ocean Cargo. Retrieved 5 January 2016. ^ "Executive Profile: Johan Linden, Chief Executive Officer and President, Dole Food Company, Inc". Bloomberg. January 2018. Retrieved 31 January 2018. ^ "2017 Ranking of America's Largest Private Companies: Dole Food". Forbes. 2018. Retrieved 31 January 2018. ^ "All About Dole Products". official web site. Dole Food, Inc. Retrieved September 15, 2010. ^ "Dole gets ready to turn first shovel of headquarters dirt: plans are set to go to Westlake Village City Council". Los Angeles Business Journal. January 31, 1994. Retrieved September 15, 2010. ^ "Dole Plantation - Hawaii's Complete Pineapple Experience - Maze". Dole Plantation, Inc. Archived from the original on 2008-01-21. Retrieved 2008-02-14. ^ "WhatsASuperkid". Dole. Retrieved 2012-10-05. ^ "Homepage". Dole. 2010-06-21. Retrieved 2012-10-05. ^ Murphy, Joan (October 17, 2005). "Minnesota finds E. coli in lettuce bags". The Produce News. Oradell, NJ, USA. ISSN 0032-969X. OCLC 4109334. Archived from the original on February 8, 2009. Retrieved October 5, 2012 – via Wayback Machine. ^ "E. coli Food Poisoning". About-ecoli.com. 2006-10-27. Retrieved 2012-10-05. ^ Ordman, Marty (September 17, 2007). "Dole Fresh Vegetables Announces Voluntary Recall of 'Dole Hearts Delight' Packaged Salads". Food and Drug Administration. Silver Spring. Retrieved January 23, 2016. ^ a b c Marler, Bill (May 2, 2016). "Will the Justice Department look at Dole's history of recalls and outbreaks?". Food Safety News. Retrieved May 3, 2016. ^ "Dole Brand Salad Recalled in Canada Due to Potential Listeria Contamination". Food Safety News. Seattle. March 13, 2014. Retrieved January 24, 2014. ^ "Dole Expands Bagged Salad Recall to the U.S. Over Listeria Concerns". Food Safety News. Seattle. March 14, 2014. Retrieved January 24, 2016. ^ Goldfield, Bill (October 13, 2015). "Dole Fresh Vegetables Announces Precautionary Recall of Limited Number of Spinach Salads". Food and Drug Administration. Silver Spring. ^ "Multistate Outbreak of Listeriosis Linked to Packaged Salads Produced at Springfield, Ohio Dole Processing Facility". Centers for Disease Control and Prevention. Atlanta. January 22, 2016. Retrieved January 23, 2013. ^ Szabo, Liz (January 22, 2016). "1 dead, 11 others hospitalized in listeria outbreak linked to Dole salads". USA Today. Tysons Corner. Retrieved January 23, 2016. ^ Newman, Jesse; Brat, Ilan (January 22, 2016). "Listeria Outbreak Linked to Dole Salads From Ohio Facility". The Wall Street Journal. New York City. Retrieved January 23, 2016. ^ Sifferlin, Alexandra (January 22, 2016). "Listeria Outbreak Linked to Dole's Packaged Salads". Time. New York City. Retrieved January 23, 2016. ^ "Food Recall Warning: Certain Dole brand pre-packaged chopped salads, salad blends and kits and leafy greens and certain PC Organics brand leafy greens recalled due to Listeria monocytogenes". Canadian Food Inspection Agency. Ottawa. January 22, 2016. Retrieved January 24, 2016. ^ "Dole Fresh Vegetables Announces a Voluntary Withdrawal of Salads Processed at its Springfield OH Processing Facility". Dole Food Company. Westlake Village. January 22, 2016. Retrieved January 23, 2016. ^ a b Beach, Coral (April 29, 2016). "Dole knew of Listeria; feds launch criminal investigation". Food Safety News. Retrieved April 30, 2016. ^ "DeLauro Demands That Dole Answer For Distributing Contaminated Salads That Killed Americans". United States House of Representatives. Washington, DC. April 29, 2016. Retrieved May 2, 2016. ^ Beach, Coral (April 30, 2016). "Dole salad scandal spurs calls for stronger FDA". Food Safety News. Retrieved May 2, 2016. ^ Siddall, John William, ed. (1921). Men of Hawaii: a biographical reference library, complete and authentic, of the men of note and substantial achievement in the Hawaiian Islands. The Story of Hawaii and its builders. 2. Honolulu, HI, USA: Honolulu Star-Bulletin. p. 133. LCCN 22017988. OCLC 80553001, 32127632, 16326675. Retrieved October 4, 2012. ^ Kinzer, Stephen. Overthrow: America's Century of Regime Change from Hawaii to Iraq. Times Books. ISBN 0-8050-7861-4. ^ Peter Chapman (July 2009). Bananas: How the United Fruit Company Shaped the World. Canongate U.S. p. 21. ISBN 978-1-84767-194-3. ^ Anup Shah (January 3, 2010). "The Banana Trade War". Global Issues Blog. Retrieved September 15, 2010. ^ "Juana Perez 1-51/Juan Perez 5E-50 v. Dole Food Company, Inc". Cases. International Rights Advocates. April 2009. Archived from the original on 2010-05-23. Retrieved 2010-01-20. ^ a b "Dole Uses Judge Attack in Banana Case to Undo $2 Billion Awards". Bloomberg. June 24, 2009. ^ Edelman, Scott A. (May 8, 2009). "Letter from Dole, May 8, 2009" (PDF). bananasthemovie.com. Retrieved October 6, 2012. ^ "Interview with director Fredrik Gertten | BANANAS!*". Bananasthemovie.com. Retrieved 2012-10-05. ^ "Bananas får inte tävla på festival - Regionala nyheter". svt.se. Archived from the original on 2012-10-06. Retrieved 2012-10-05. ^ Deutcsh, Linda (July 9, 2009). "Dole sues 'Bananas!' filmmaker, alleges defamation". The Seattle Times. Seattle, WA, USA: The Seattle Times Company. Associated Press. Retrieved October 4, 2012. ^ Victoria Kim (July 16, 2010). "Judge throws out verdict awarding millions to Dole workers". Los Angeles Times. Retrieved September 15, 2010. ^ "Dole bananas not ethical - Oxfam". 3 News NZ. May 28, 2013. ^ "Govt blacklists Dole-Thailand over labour dispute". MyanmarTimes MM. Oct 10, 2018. ^ "Who's Funding Prop 37, Labeling for Genetically Engineered Foods? | Propositions | Elections 2012". KCET.org. Retrieved 2015-06-06. Wikimedia Commons has media related to Dole Food Company.